Finding it difficult to fit one of our tours into your schedule? Looking for a family or private group get away? Then schedule your own — almost 90% of our tours and over hundreds since 1993, are actually custom-tailored, private adventures for families, couples, and groups of friends. Whether you're US Pro Champion Tony Cruz (right) looking to put on a thousand miles of off-season riding, or the Bellingham family (below) escaping for a few days with the kids to the Mekong Delta, we've got you covered. With recommendations, we'll design the perfect itinerary to your specifications and desires, make all arrangements for your group, including regional air travel and accommodations, provide experienced guides, rental bikes and kayaks, and assist with airlines and visas, pre and post-tour arrangements, leaving your group to have a hassle-free, unforgettable trip. in Vietnam, we often have previous clients of B&R and B&R. You can expect a similar level of quality, but a more comprehensive tour and better value, please compare itineraries and what's included. If you are planning a private tour, booking at least six months in advance is recommended to secure the dates you prefer. See more information on our family tours. If you're looking for a wonderful trip, nobody knows Vietnam, Thailand or Myanmar better than we do! On the ground (and in the water) our knowledge of Vietnam was gained one pedal or paddle stroke at a time, which is why National Geographic Adventure entrusted us to arrange John Bowermaster's kayak expedition. And our tours offer much more than cycling and kayaking. If you're looking for a specific focus to your trip, such as cuisine, the arts, personal encounters — you name it — we can tailor the tour around tour interests, or recommend a mix of popular activities. As with all of our trips, Vietnam-based SOS International emergency medical and air evacuation coverage is included. 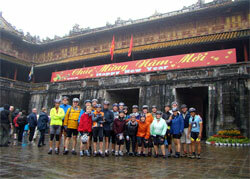 Please call or email to request other example itineraries of our custom-tailored tours. After a rough itinerary, we then gear the trip to your level of your group's fitness, along with a specific interests, be it culinary, architecture, historical, or a mix of these interests and activities. 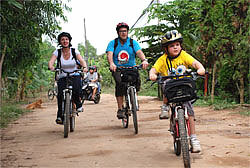 All transport is provided, with experienced cycling guide and driver, and hotels by preference. From years of feeding hungry cyclists, we also keep current on the best eating in Vietnam. Note: We have a limited number of private tours we can operate at any given time. To book a high-season trip for your group in Vietnam or Myanmar (December through February), you should confirm all arrangements for your tour by the previous September to avoid disappointment — we cannot guarantee availability afterwards. "We had a fabulous honeymoon! Everyone took great care of us and taught us so much about Vietnam. It has been a great experience and we have some great pictures. We have already decided to go back to Vietnam (since Jon wants to do more cycling and shopping - not! Thought this would make Lam laugh). 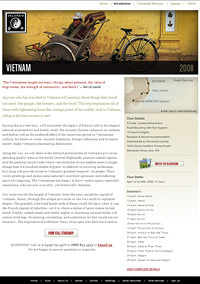 In 1993 VeloAsia pioneered the first adventure trips in Vietnam and in 1999, into Myanmar (Burma). Over that time, we've organized hundreds of original and unique trips throughout the region that are, as many of our past travelers have said, adventures of a lifetime.